December 13, 2018 – Dayco an exhibitor at the PRI trade show, was a proud recipient of the 2019 PRI Global Media Award for their RPX Race Series belt. One of the newest additions to the Dayco Racing line. Dayco participated with an exclusive group of exhibitors in the 2018 PRI Featured Products Showcase. The RPX Race Series belt was selected by Canada’s own Inside Track Motorsports news journalist, Greg MacPherson based on the product’s international consumer appeal. “I kept an eye out for products that would be of particular interest to Canadian racers. Our magazine features all types of racing, we’re always interested in products that are tested, developed and proven in racing machines, including snowmobiles. The Dayco RPX Belt was a natural for consideration, the fact that it is the official belt of the CSRA and is still easily accessible to the buying public was the clincher.” said Greg MacPherson, Inside Track Motorsports journalist. The all new RPX Race Series Belt, engineered by Dayco features a specially blended RPX compound, making it the strongest aramid belt available in the market today. The advantages of racers using the RPX belt allows for quicker upshifts and downshifts for improved engine braking, a quicker throttle response, reduced belt slippage through RPM range and delivers more HP to the track. “As we continue to build on over 100 years of racing, we are committed to bringing innovative products to market. The RPX Race Series belt was engineered with the snowcross racer in mind, giving them several advantages amongst the competition. 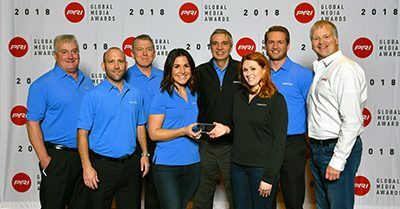 Dayco is honored to have received the 2019 PRI Global Media Award in recognigiton of our new RPX Race Series belt.” said John Kinnick, executive vice president US aftermarket.